Friends of the Earth Keep Cup - Reduced Rate This Week! Our limited edition Friends of the Earth Keep Cups have been hugely popular since we launched them as part of the Sick of Plastic Campaign this time last year. To celebrate one year of the campaign we've decided to offer them at a reduced rate for one week only in the lead up to Christmas. Until now we have been exclusively gifting our Keep Cups to new monthly donors and those who give €100 or more. But for the next week only, if you donate €50 or more to Friends of the Earth you will receive one of our Keep Cups in time for filling your Christmas stockings! Why have our reusable cups been so popular? We can spark the solar revolution if we act right now. Over 20,000 people signed our petition to support solar power in Ireland. Even Leo signed, while hanging out at Electric Picnic before he was Taoiseach. He agreed then there should be a fair payment for solar power. And now it could happen, if you email your TDs today. The Dáil will debate a draft law next Tuesday (the 27th) which would finally mean small-scale generators of renewable energy would get paid for the electricity they supply to the grid. Will you ask your TD to support it? At the moment in Ireland if you generate your own energy, any you don't use it all immediately, you have to give it away for free to the ESB. Ready to Rise? Here are three opportunities for you to get involved and take action! Sick of plastic? Worried about climate change? Eager to take action but unsure where to start? Here are three concrete ways you can get involved in taking action for a better, safer, more just world. Hiring: Young FoE Ireland Food Sovereignty Events & Communications Officer! Friends of the Earth Ireland is seeking an Events and Communications officer to promote food sovereignty within an 18-35 age range in Ireland. The post is half-time and based in the Friends of the Earth Ireland office in Dublin. Application details are at the bottom of this page. 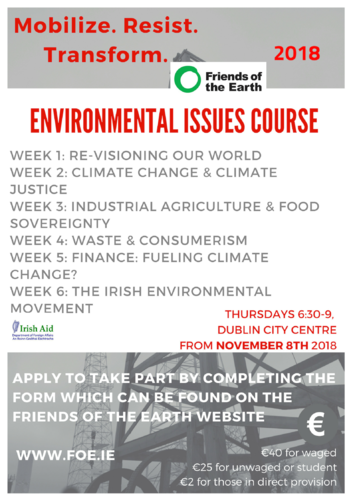 Friends of the Earth Ireland is an environmental justice campaigning organization, striving to create a just world where both people and nature thrive. It is a member of the Irish Environmental Network, the Environmental Pillar, and is the secretariat of the Stop Climate Chaos coalition Ireland, a network of 28 civil society, youth and faith-based organisations campaigning for Ireland to do its fair share on climate. We are a small organization of 2 full-time staff, and 3 part-time staff. Women are on the front lines of climate change as they are impacted first and worst, so it is not surprising that they are on the front lines of the fight against it. Around the world it is prominently women who are standing up for their communities, land, water, forests and biodiversity, while challenging projects of so-called development, from mega dams and mines to fossil fuel extraction. This is also the case in Cyprus, where strong female activists led the way in the struggle for environmental justice.